Barron's: This morning Lehman’s Tim Luke mentioned weakness in Micron's image sensor business. To me this is quite a natural result of Micron's inability to deliver high-quality 1.75um sensors, while 2.2um sensors are rapidly becoming a place of intense competition for 6-7 other companies. The best solution for Micron would be to sway the market to smaller pixels, but so far 1.75um pixel preformance is not there. Another Barron's article cites Adam Benjamin, an analyst at Jefferies & Co., who expects disappointing news when OmniVision on Thursday reports its financial results for the fiscal third quarter ended January. Benjamin says the company is being hit by “severe” pricing pressure in VGA image sensors - and a slower than expected shift in the market away from VGA to higher margin megapixel sensors. Mobileburn: Samsung has signed on to make use of the Varioptic lenses, and we might see a commercial release of a Varioptic equipped phone from Samsung as soon as Q3 of this year. Varioptic says that when purchased in volume, modules making use of their lens should cost about one third as much as traditional servo or coil based systems. Optically, the Varioptic lens has a 20 diopter range of focus. The lens will work for normal cameraphone usage and for special situations that require very close focusing. The lens is capable of focusing as closely as 5cm. One discussed point was the ability of Varioptic lens to withstand high G-force and low temperature situations. Varioptic claims that neither proved to be a problem for the lens. In particular, the lens does indeed slow down in cold temperatures, but that it still worked fast enough to keep ahead of the LCD displays used in mobile devices, which slow down greatly in cold. Globes: Samsung has been negotiating to acquire CMOS imaging start-up TransChip for a sum reported to be as much as $100 million. TransChip chairman and CEO Dr. Viktor Ariel founded the company in 1999. He was joined by former employees of IBM, Intel and Zoran. TransChip has been collaborating for years with Analog Devices, Intel, Ceva and other companies to jointly develop imaging processors for videos and mobile devices. Analog Devices founder and chairman Ray Stata and Qualcomm founder and chairman Prof. Andrew Viterbi both serve on TransChips’ board after investing in the company. Cadence made its first investment in the company four years ago. Embedded software maker Fotonation announced two new products for camera-phones: Face Detection and Red-Eye Correction. Face Tracker subroutine "uses a radically new approach" and "accurately follows faces in frontal or profile positions and can establish the correct image orientation automatically". As Imaging Resource reports, Pentax uses Fotonation's Face Tracker software in its Optio A30 camera. I was shown a flyer of Micron MT9M113 sensor which belongs to the 2nd generation 1.75um pixel family. This is 1.3MP 1/6" SOC integrating sensor with ISP and 68H11 microcontroller and MIPI interface. Obviously, the most interesting part of the flyer is the 2nd generation 1.75um pixel data. The SNR is specified as >37db (Max), barely higher than 36db of the 1st generation. The DR is >60db for pixel only. Even assuming its full-well is about 7Ke, like the previous generation, 60db number translates to about 7e of noise, more in case of bigger full well. Either Micron is very conservative when just saying "greater than 60db", or the new generation does not bring the much needed improvement in full well capacity and readout noise, or so it seems. The flyer is dated by Feb. 1, 2007, that is pretty recent. An interesting new blog "Korea Semiconductor" put together profiles of Pixelplus, Siliconfile, Corelogic and Mtekvision. EE Times: Is there a missing piece in Micron's strategy? Appleton: Yes, there is a missing piece. It's packaging. We do a lot of packaging as you know. We have a big assembly operation. But in an integrated model, we are missing parts of the packaging for the next-generation of applications. In particular, when you think how that translates to the imaging business, you think about wafer-level modules, lenses, and camera module integration. We have a lot of partners for that. EE Times: So do you acquire a company or bring more expertise in house? Appleton: We will do both. We will acquire companies that have expertise in the area. At the same time, we will also have to continue partnerships. "The more recent Toshiba 3.2 Megapixel CIS, featured a variation on this 5T layout, but with a surprising twist. From a circuit perspective, the structure is still the same, with pairs of pixels still sharing the T3, T4 and T5 transistors. However structurally there is a difference - additional polysilicon slabs have been placed in between adjacent pixels in a column. We believe they help electrically separate pixels that lie on a common diffusion – at a cost. The performance trade-off must have been considered because additional polysilicon structures generally reduce the fill factor (the amount of light reaching the photo-cathode versus that hitting the pixel) for the CIS pixel. Additionally, there is an extra slab of polysilicon extended over the centre of the active area of the red pixels. This may reduce sensitivity to red light since it must pass through the poly slab (note that wavelengths shorter than red light have a higher absorption coefficient and will be less able to penetrate the silicon) but it would increase the RGB color separation of the pixels." Yahoo: Pixim proudly announces that cameras powered by its sensors won the top five rankings for best wide DR security cameras, out of a total of sixteen cameras tested by Protector Magazine, the physical security publication in Germany. Customers shipping Pixim chipsets in their security camera products include: Baxall, CIEFFE, Dallmeier, EverFocus, Tyco Fire & Security, GE Security, General Solutions, Honeywell, Ikegami, JVC, Pelco, Siemens, Sunell, D-Max, GSP, Verint, Cohu Electronics, ChipER, deView, Eagle Technology, ioimage, FSAN, Lumenera, Pacific Communications, Nuvation, VTC, Videor Technical, Smartvue, DVTel, Mosaic, Intellicam Digital Security, LJD Digital Security, and Electronics Line USA. 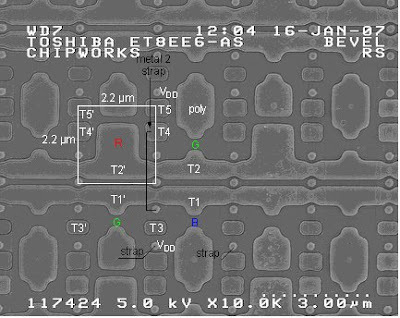 Business Wire: e2V, best known for its EMCCD, is going to use Tower Fab2 0.18um process to produce its CMOS SOC sensors. This deal will further enhance e2v’s position in key markets, such as medical and industrial imaging, growing at annual rates of 10-15%. e2v and Tower are currently focusing on ten key development projects. Semiconductor Times compiled Forza and inSilica profiles for its February 2007 issue. Forza Silicon was founded in 2001 to provide mixed signal IC design services and products. In May 2004, the company raised an undisclosed amount of Series A funding from strategic investors (customers), and has no current plans for seeking additional capital. Forza has more than 20 employees, mostly mixed-signal designers. Forza founder, Barmak Mansoorian, PhD., authored several of the patents in the CalTech APS patent portfolio. Dr. Mansoorian worked with Eric Fossum, PhD. (now the CEO of Siimpel and previously the CEO of Photobit), on APS technology at NASA JPL and Photobit, before co-founding Forza. The company’s strategy is to offer both IC design services and specialized IC products. Forza argues that it has no competitors in terms of CMOS image sensor design services. The company has designed ASIC driver for Siimpel. Forza has foundry experience with IBM, Tower, ST, Freescale, TSMC, UMC, Vanguard, AMS, AMI and Magnachip. inSilica was founded in 2003 on an Indo-US model, where executive and engineering leadership is driven in Silicon Valley, combined with a highly skilled and scalable India-based implementation team. Company headquarters is in Santa Clara, California and major design centers are in India and Slovenia. In April 2004, inSilica closed $10 million in Series B funding from New-Path Ventures and Flextronics. Flextronics had expanded its silicon development capabilities by partnering with inSilica as its SoC development partner. In July 2006, InSilica closed $18 million in new financing from Intel Capital, Flextronics, Crossbow Ventures, Dow Ventures, and NewPath Ventures. inSilica provides advanced standard mobile imaging solutions to bring high end digital still camera quality to the mobile phone market at minimal cost impact. The company’s Image Signal Processing solutions take raw output from the low cost CMOS sensor, compensate for lens defects, noise, and color issues, perform extensive analytics for automatic exposure settings, and use proprietary enhancement algorithms to deliver a very high quality photographic image in all light conditions. InSilica recently unveiled its next generation image processor for the mobile phone segment. The INS-3510 brings full 3 & 5 Megapixel Digital Still Camera class capabilities to lower cost mobile phones. It includes features such as Advanced Adaptive Tone Mapping to ensure color correctness in variety of lighting sources, full auto-functions including auto exposure, auto white balance, and user selectable multipoint autofocus. Through its programmable architecture, additional features such as special effects can be included. The INS-3510 is designed in 90nm CMOS to attain very small die size and low power consumption. Optimized firmware and tuning for all primary image sensor providers enables handset OEMs to use a variety of sensor sources. In 2007, InSilica plans to introduce a series of products covering the full range of the mobile imaging markets. The company has numerous customer engagements, IP development projects, and partnerships. The INS-3510 provides a dramatic advance in price/performance over its predecessor, which shipped over 4 million units in 2H’06. The company expects handset and camera module customers to launch production systems based in the INS-3510 in Q1’07. Sony announced its fast 6.4MP 60fps sensor, first described a year ago on ISSCC 2006. The pixel pitch is 2.5um, quite good for a 0.18um process. CX-News published a review article on the chip features and characteristics. The chip seems to be in prototype stage, although design team says "all we had to do was to wait for mass production". The IMX017 flyer is here. It came to my attention that Omnivision's OV630 TrueFocus ISP also has "Anti-Vibration" feature. Announced in shadow of TrueFocus, "anti-vibration" got little or no attention in most articles. I'm wondering how similar is this to Sony's image stabilization DSP. Sounds improbable considering OV630 does not have external DRAM support and just 7.5fps speed of OV3632 sensor. If not, how does this "anti-vibration" work? In the paper Micron reports 6.1e/s dark current at 30C. This has been translated into 90e/s at 60C, assuming dark current is doubling every 7-8C. Overall, after more than 2 years work on 1.75um pixel, Micron results do not impress. Micron's saturation level is the lowest of the class, while the dark current is the highest. In fact the initial pixel data that Micron announced in 2005 was much better. But let's not forget that the ISSCC paper presents the first generation of 1.75um pixel. On 3GSM Micron just launched the 2nd generation. Hope this second iteration will have better spec. Looking back on 2.2um pixels, Micron dramatically changed its second generation pixel design and got a huge performance improvement in the recent 2.2um sensors. May be 1.75um pixel development will follow the same path. EETimes: Silicon Hive has agreed to supply its HiveFlex ISP 2200 processor to MagnaChip. MagnaChip has integrated the HiveFlex ISP 2200 processor into the MC531EA image sensor. The processor provides ANSI-C programmability directly on to the image sensor, which can help address time to market and time in market pressures. EETimes: It's official - ESS said it would cease operation of its camera phone business and pursue licensing of its image sensor technology and patents. The company said this action would reduce operating expenses by roughly $2 million per quarter. ESS announced it would sell the camera phone line last September, when the firm cut 25 percent of its work force. Perhaps nobody was interested in buying it. Tech-On: Sharp unveiled a combo at the ISSCC 2007 - VGA LCD panel with embedded image sensor. Quite an interesting technology. EETimes gives a few bits from Micron's ISSCC presentation a few days ago. The paper was presented by KB Cho, a senior VLSI design engineer from Micron's Imaging Design Center in Pasadena. The 8MP MT9E001 imager includes a low-noise signal readout chain, a 12-bit analog-to-digital converter, an internal phase-locked loop and a 12- bit parallel interface to output pixel data at up to 96 megapixels per second (Mp/s), according to the paper. It uses top and bottom multiple channels with a double-data-rate analog signal readout at a rate of 96 Mp/s, which results in 15 frames per second (fps) at full resolution and 30 fps at VGA resolution. Operating power consumption of the chip in full resolution at 11 fps is less than 400mW. With dynamic power management, a reduction of more than 30 percent of total power is achieved by turning off analog blocks for a period of time. The imager is fabricated in a standard 0.13-micron CMOS process. Cho said following the presentation that the design includes "more than two" metal layers, but declined to specify further. "In my opinion, we outperform conventional CCD sensors with the same optical format," Cho said, citing low power consumption, high speed, higher signal-to-noise ratio and low-light sensitivity. "One of the strengths of this chip is that we have a high conversion gain. That gives us quite a high sensitivity." A Micron spokeswoman said the MT9E001 is currently sampling and is expected to be in volume production late this quarter or early in the second quarter. In 2006, roughly 79 percent of digital still cameras employed CCD image sensors, according to IC Insights. By 2009, the firm expects CMOS image sensors to surpass CCD image sensors in digital still camera market share. Imaging Resource has a year old PMA 2006 video interview with Nicolas Touchard, the Vice President of DxO labs, about their new DxO Digital Optics Technology. Nicolas promises to dramatically improve the performance of cameraphones in lowlight situations because DxO-specific lens can have larger aperture. He describes digital auto focusing feature as well. The video ends with a nice demo of DxO technology. Now, a year later, we see that DxO approach starts to bear first fruits. Imaging Resource: The previously announced Magniachip MC531EA Digital Auto-Focus (DAF) Extended Depth-of-Field (EDoF) Priority features are based on DxO Labs technology. Tessera seems to spend a lot off efforts to rise awarness of its Shellcase packaging. This time Electronic Design publishes an article about the new genaration RT package. RT family employs a thin polymer on one side of the chip—instead of the previous two-sided glass sandwich. 0.5-mm package profile, compared to the 0.9 mm of the old OC family. Package height (excluding the BGA) is about 400 µm, ±25 µm. Scribe-line widths are reduced from 260 and 250 µm down to 100 µm. Bond pad sizes dropped from 150 by 50 µm to 70 by 50 µm. Bond pad pitch was reduced from 350 to 180 µm. EETimes: In line with the modern trend of IDMs "dis-integration", Sony announces plans to become fab-lite. Sony has about 60 percent market share in the CCD imager market and is now reinforcing CMOS sensors as well. 150 engineers were shifted to the imager section from audio/video sections to boost the development. Tech-On reports that despite the cuts among semiconductor businesses, Sony will focus its capital on image sensors including CCD and CMOS sensors. EETimes writes that the newly announced 1.75um mobile phone sensors use a second iteration of Micron's 1.75-micron pixels, while 8-Megapixel DSC image sensors announced last year were designed in the first version of the 1.75um pixel technology. "We expect the first phones that use these sensors to be shipping in the fourth quarter this year," said Sandor Barna, senior director for strategy and planning at Micron's Imaging division. The Register: Varioptic marketing manager Philippe Ruffin told El Reg: "It's much more reliable than mechanical alternatives. It can focus on a shorter distance - to about 5cm - and it's much faster [to focus] than a mechanical lens. On an ordinary module it will work at 800ms but we can tune that to 500ms." Ruffin said the company's factory in Shanghai has capacity to produce 100,000 lenses a month and its plant in Lyon another 25,000. He said the company expects to take a large share of autofocus camera phones - usually above three megapixels, but also expects it as a way for handset makers to improve two-megapixel or lower-resolution devices. "The next big story you will hear from us will be a handset deal," he said. Yahoo: Omnivision unveiled a 1/10 inch VGA CameraChip sensor, the OV7680 using a 2.2-micron pixel size. The unique non-linear micro lens shift technology featured in the OV7680 permits a reduction in the distance between the sensor and the lens, reducing the height of the camera module to just 3.0 mm without compromising image quality or camera performance. It enables a module size of just 4.5 x 4.5 x 3.0 mm, dimensions that allow for a single element plastic lens design. CMP sites EETimes and PlanetAnalog review the digital AF solutions announces on 3GSM, presenting it as a new big exciting technology. "According to iSuppli, revenues from shipments of image sensors for handsets will grow to US$5.9 billion by 2010, increasing at a compound annual growth rate (CAGR) of 27.4%, up from US$1.7 billion in 2005. Unit shipments of image sensors to handsets will grow to 1.2 billion by 2010, increasing at a CAGR of 19.7%, up from 484 million units in 2005. However, the market research firm stated that the average camera phone will not reach the four to five megapixel level range until 2010." SeekingAlpha: The company has been around for a long, long time. Its investors had to be very patient for many years of painful grinding when literally nothing happened. Meanwhile, Tessera’s technology innovations managed to get patented. At the time, no one paid attention to esoteric chip packaging techniques like chip-scale and multi-chip. And then the miniaturization wave hit the electronics industry. Every cell phone was suddenly infringing on Tessera’s patents, and had to pay them royalty fees. An important patent infringement suit won against Samsung in late 2004 shot the stock up $20. And since then, money has kept rolling in. Today, Tessera runs a fat gross margin business that ranges between 80%-95%. Their primary business is licensing of technology for chip-scale and multi-chip packaging for miniaturization in electronic products. Most semiconductor chips that are utilized in various electronics products, including digital audio players, digital cameras, personal computers, personal digital assistants, video game consoles, and mobile phones have something to do with Tessera’s patents. In terms of royalties, Tessera receives an estimated 6 cents to 14 cents on each cell phone handset, between 5 cents and 15 cents on each video camera, and 30 cents or more on each computer. In the last two years, Tessera has made several acquisitions: Shellcase, Digital Optics, and Eyesquad. Shellcase is the world’s leading provider of commercially available wafer level image sensor packaging technology. Shellcase’s broad technology portfolio includes wafer-level packaging for image sensors and other devices. The world’s largest cellular phone manufacturers utilize image sensors packaged in Shellcase technology for cellular phones that integrate highly reliable, miniaturized digital cameras. Packaging for Image Sensors and MEMS Devices is forecasted to become a 7.3 Billion Unit Market by 2009. Tessera bought Shellcase for $33 Million. Tessera acquired Digital Optics last July for $59.5 million. Digital Optics develops and designs micro-optical technologies. Micro-optics is the use of microscopic structures to shape and influence light. The Digital Optics team and key technology will be components in Tessera’s development of low-cost, miniaturized imaging solutions for high-volume consumer optics applications, such as camera phones, next-generation DVD players and automotive applications. According to the most recent forecast from market research firm Techno Systems Research [TSR], the market for camera phones will increase to approximately 825 million units in 2009, representing a 21 percent compounded annual growth rate from 2005. Recently, Tessera also bought Eyesquad, a Tel Aviv, Israel company that designs digital auto-focus and optical zoom products for cameras in camera phones and other products. The purchase price was $18 million in cash, and it strengthens Tessera’s position in the camera phone market. To summarize Tessera’s strategy, it has been systematically rolling-up important technology modules that are essential in the growing hyper-integration and miniaturization trends around consumer electronics. Their primary business model of technology licensing is a highly profitable model, and if they can continue to roll-up more of the components of electronics miniaturization (e.g. audio, memory, imaging, even computing), there is no reason for the company to not continue growing systematically. As a break of cellular imagers bonanza, Thomson introduces Grass Valley Xensium, a new high performance CMOS sensor. The native high definition sensor has an array of 2.4 million pixels. The claim is that Xensium offers a wider dynamic range, lower power consumption and improved signal-to-noise performance when compared to current CCD and CMOS imagers. It was developed by Grass Valley engineers in collaboration with colleagues at Thomson Technology's Silicon Components division and within a European Union Medea+ programme. The 2/3-inch 1920 x 1080 active pixel Xensium HD sensor, supporting 1080p, 1080i and 720p high definition natively, will first be used in production models of the Grass Valley Infinity Digital Media Camcorder , and the Xensium line of imagers will become a standard in future generation Grass Valley camera products across a broad range of applications. The auto-focus technologies parade is going on on 3GSM. Magnachip launches industry's first single-chip Digital Auto-Focus (DAF) solution. Sys-Con Media: Magnachip announced the launch of Imaging System on a Chip (SoC) incorporating a digital auto-focus engine. The MC531EA is a 1/3.2" optical format 3.2 mega-pixel (2048 x 1536) CMOS sensor with integrated image processing, a high speed 48-way SIMD processor which requires no external memory and can run enhanced depth of field (EDoF) and digital auto-focus (DAF) algorithms. The MC531EA makes use of MagnaChip's 2.2um pixel. The MC521EA also features an on-board ARM7TDMI core that can be programmed with different algorithms for auto-function control, such as auto white balance with color temperature detection and tonal mapping, and auto exposure with scene dependent compensation. "The features we have incorporated into the MC531EA single chip solution are normally found in 3 chip solutions in digital still cameras," said Jason Hartlove, Senior Vice President of the Imaging Solutions Division. "While 3 mega-pixel cameras are leading edge for handset implementations, designs today require expensive multi-chip solutions with large, power hungry moving actuators which attempt to mimic the functionality of Digital Still Cameras (DSCs). MagnaChip, has gone beyond the DSC capabilities by integrating support for new technologies such as digital auto-focus, all within a single chip solution that does not require any external components. This eliminates the need for an actuator, making it easier for manufacturers to create small form factor, mechanically robust solutions with a lower total system cost." Samples of the MC531EA will be available in February. No production timing is announced. "DxO Labs today announces a licensing agreement and a strategic cooperation with STMicroelectronics to develop and bring to market breakthrough imaging sensors and camera modules featuring DxO Digital Optics, a revolutionary embedded imaging technology. A new generation of STMicroelectronics imaging modules will feature full auto-focus functionality without any motor or moving parts, enabling DxO Digital Optics fixed lens optics to deliver sharp images from a very short distance to infinity. The resulting products will initially target the high-end mobile imaging market (3 and 5 Mpix camera modules). DxO Digital Optics Digital Auto-Focus Extended Depth-of-Field Priority (or DxO Digital Optics DAF EDoF Priority) is just one of the implementations enabled by DxO Digital Optics technology which is based on a unique co-design of optics and image signal processing. For cameraphone vendors, this digital auto-focus solution is a more efficient alternative to traditional mechanical actuator-based auto-focus. It acts instantaneously, drastically shrinks module size, significantly reduces power consumption, and contributes to substantial cost reductions while providing better image quality even in very low light conditions. One of the hot features long sought by cameraphone vendors is Extended Depth-of-Field (EDoF). Unlike traditional actuator-based auto-focus which tends to deliver limited depth of field, DxO Digital Optics DAF EDoF Priority provides a uniformly sharp image from the foreground to the background. “Extending the depth of field of fixed focus high resolution camera modules while preserving image quality and keeping costs down is the dream of our industry. DxO Labs, with DxO Digital Optics, has definitely the right technology to achieve this goal,” says Philippe Quinio, STMicroelectronics' Imaging Division Marketing Director. Omnivision put much more Truefocus info on its site. It comes out that Truefocus is 2-chip solution, having a companion ISP OV630. The ISP has a non-standard 1.3V supply for its core logic, meaning it uses either overdriven 0.13um process, or some low-voltage flavour of 0.15um. It supports up to 3MP resolution, which explains why 5MP module uses a more conventional AF. The power consumption is 200mA in active mode. "I am happy to announce that we have presented our first paper on the MEMS (Micro-electro-mechanical system) autofocus camera module for camera phones. It is for 1/3" format, nominally 2 or 3 megapixel sensors. Among other things, handset manufacturers require that the camera in the handset survive dozens of drops directly onto concrete from waist or shoulder height. Try that with your DSC, esp. when there are moving parts inside. We are currently meeting shock levels exceeding 5000 Gs. Also, the whole camera has to cost the camera manufacturer about $10-$15 to make, including sensor, lens AF actuator, housing, etc. It also has to be fairly robust to manufacturing tolerances since millions per month need to be reliably manufactured. We are currently in pre-production of the MEMS component at the "low" rate of 10,000 units per day. We expect to see it in a tier 1 handset in Q4'07. The linked paper has a lot of technical information in it. I am quite pleased with the 2Mpix imaging performance. While it is hardly a DSLR, we welcome your comments and thoughts. At http://www.siimpel.com you can find me under "management" and the paper under "news"." The direct link to the paper is here. Omnivision Truefocus Camera Module Launched? Omnivision launched its first product incorporating waveform-coding based Truefocus. Well, sort of launched, as there is neither a part number nor a production schedule announced. Yahoo: OmniVision is demonstrating the 3-megapixel TrueFocus camera this week at its booth at the 3GSM World Congress in Barcelona, Spain. From a manufacturer and system designer's point of view, transitioning to TrueFocus cameras is simple and straightforward. TrueFocus modules are smaller than the AF modules that are currently available. In TrueFocus systems, the mechanics found in classical AF systems move to silicon and thus become subject to Moore's Law. Wavefront Coded lenses can be formed in plastic at a cost comparable to classical lenses, and will be offered through major lens manufacturers. Replacing mechanical parts with lenses that do not require focusing during assembly simplifies sourcing and manufacturing by combining high quality optical systems with relaxed manufacturing tolerances. With no moving parts, a TrueFocus module requires less power, and performs more reliably in extreme temperatures. Wavefront Coding was invented by the founders of CDM Optics and is protected by numerous U.S. and foreign patents dating from 1995. A Wavefront Coded system differs from a classical digital imaging system in two fundamental ways. First, the light traveling through a Wavefront Coded lens system is not focused on a specific focal plane. Instead, the specially designed lens system defocuses the light from each point in the field of view, regardless of its distance from the camera, and creates an intermediate unfocussed image. Another way to describe this effect is to say that the special Wavefront Coded lens system changes the path of each light ray such that the light deviates from the path that it would take when passing through a classical lens. The modification of the direction of the light as it passes through the lens system is referred to as "encoding." The second difference found in a Wavefront Coded system, referred to as "decoding," arises when the intermediate unfocussed image is restored by digital processing. The intermediate image from the sensor is processed to produce an image that is as sharp and clear as a conventional image, but has the important non-classical property that the depth of field (or depth of focus) is much greater than that produced by a conventional lens system using an equivalent aperture or 'f' stop number. Yahoo: The OV5623 CameraChip sensor at the heart of the 5 megapixel module has an optical format of just 1/2.5 inches and a 2592 x 1944 image array with digital image stabilization capability. A 10-bit A/D converter enables the OV5623 to operate at 7.5 frames per second (fps) in full resolution or 60 fps at a 864 x 648 resolution for enhanced video viewing on a TV screen. The OV5623 is built using OmniVision's proprietary OmniPixel2(TM) technology manufactured using 0.13-micron CMOS process technology. The OV5623 design incorporates OmniVision's zero-gap micro-lens structures, improving the overall sensitivity of the device. In addition, the sensor's improved quantum efficiency optimizes image performance by further increasing full well capacity. The 5-megapixel (product number MT9P012) fits into a 1/3.2-inch optical format and captures video at 60 frames per second (fps) at 720p and 30 fps at 1080p for high-definition video capture. The 3-megapixel (product number MT9T013) fits into the standard camera phone 1/4-inch optical format and captures VGA video at 30 fps. The 1.3-megapixel (product number MT9M113) is a completely integrated camera system on chip and fits into an ultra-tiny 1/11-inch optical format. This sensor also captures VGA video at 30 fps. General customer sampling for the 5- and 3-megapixel sensors is planned for the second quarter 2007 and the 1.3-megapixel sensor is expected to sample in late first quarter 2007. Mass production is expected summer 2007. Digitimes: Micron's wireless & mobile product of imaging group director, Vern Klein said the company is currently discussing the use of the sensors with 15-17 handset vendors, including the top-five ranked handset vendors worldwide. Shipments to handset ODMs and OEMs, including Taiwan-based makers, is also expected. End products that incorporate the new image sensors are expected to hit the market in 2008, Klein added. Advanced Imaging Pro: "We've taken Shellcase's existing technologies and evolved it into a thinner package, almost halving it from about 900 µm to 500 µm," said Mitch Reifel, Tessera's manager of business development. "This is a key concern in the image module industry, because smaller is better - just like everything else in the electronics industry." And with this latest generation, the material set and design rules are all done at the wafer level. "We've narrowed the streets [width between the dies] from about 230 µm to 100 µm to yield more net die per wafer," Reifel said. "The material set was also changed, which should lower costs by roughly 10%." Another significant change made was the improvement of the moisture sensitivity reliability from JEDEC MSL 2 to MSL 1. This allows the technology to be used in other applications, such as harsh automotive ones, which tend to have much higher reliability standards than the consumer imaging market. "Essentially, we've made the package smaller, increased its reliability and made it less expensive, because these are all driving factors within the semiconductor packaging industry," Reifel said. All this seems to be an extension of Shellcase products. Now I wonder how Digital Optics Corp.'s technology is related to these packages. So far Tessera has kept mum on this. Mitch Reifel is a long time image sensors industry veteran. He was one of the founders of YMedia startup trying to offer the smallest pixels of the time (3um pixels in 2000). Then he worked for Amkor, while simultaniously publishing YMedia blog devoted to image sensors industry. He shut down his excellent blog at about the same time he joined Tessera in Nov. 2005. OSA published a presentation on advances in optics, including folded lens. Globes: Forza and Tower are teaming to set up a center designing specialist chips which will operate out of Tower’s center in Migdal Hae’emek. ZDNET and CNET write that the small pixel size translated into higher resolution is not what consumers really need. In fact, they built their claims on the wrong base. What consumer really needs is lower price. Everybody expects digital camera price to come down well below $100. Low price means smaller imager chips, that is smaller pixels. Now the market logic becomes quite simple. If $50 camera has 5MP resolution, what is the resolution of $200 camera? Probably the best solution would be to mimic a video camera market, where the sensor size is one of the major marketing claims. So everybody percieves a camera with 1/1.5" sensor as being better than a camera with 1/6" imager. But even in video world there is a place for mess. For example, how consumer percepts 3CCD camera with 3 1/6" sensors vs single 1/4" CCD? Also, megapixel claims seems to penetrate camcorder world too. CNET also put an interesting comparison between Panasonic FZ50 noise processed and unprocessed images. ST announced VS6724 2MP camera module. It uses 2.2um pixel generation. SNR is quite low 35db, while DR is quite respectable 61db. The sensor is very fast - 30fps at full resolution. The interface is 8b parallel - a departure from ST-Nokia SMIA standard. The press release mentions that the sensor will be manufactured at the company’s leading-edge facilities in France, initially at Crolles and later on, also at Rousset. Samples of the VS6724 are available now, with volume production planned during the first quarter of 2007. Businesswire: Forza Silicon and Tower Semiconductor have announced that they are expanding their relationship to design and produce mixed signal and image sensor chips utilizing Tower’s process and design technology capabilities. Forza Silicon designs custom CMOS image sensors, which comprises Tower’s Advanced Photo Diode (APD) pixel IP, and utilizes its Fab2, 0.18-micron process technology. So now Forza has close relations in CIS design with both Tower and IBM. Tech-On: Matsushita engineers spent some time investigating their arch-rival Sony CCD problems. To solve these problems Sony has stopped using ultraviolet cured resin containing iodine to bond CCD packages since the defect was discovered. What Matsushita found is that the corrosion was closely related not only to iodine but also fluorine, which becomes alienated from ultraviolet cured resin, and bonding condition of the wire-bonded area. So the ultraviolet cured resin containing iodine can possibly be used to bond CCD packages with its reliability undamaged, if a right kind of ultraviolet cured resin, from which fluorine does not become estranged, is chosen and intensity of wire bonding is enhanced. Magnachip announced samples of 2.2um pixel sensors. Significantly lagging in pixel size race, the company tried to compensate it by packing more features onto the sensor. 2MP MC521EA sensor integrates MIPI and GPIO interface and ARM7TDMI core, while 1.3MP MC511EA offers a singe 2.8V supply. GPIO interface can be used for AF function control. Also it includes an interesting "one time programmable, non-volatile memory enabling unique module serialization and calibration". It looks like Jason is trying to replicate his previous Avago market strategy. While managing Avago imaging business he tried to compensate pixel technology deficiency by integration of advanced high-end image processing functions. This had somewhat mixed results. We will see if Jason's approach works better on Maganchip soil. The key to Eyesquad’s autofocus technology is that it uses non-mechanical techniques. “The technology is designed to open up new, high volume market opportunities,” said Tessera. The absence of moving parts means the technique can provide size, cost, reliability and power advantages over existing mechanical technologies for focus and zoom. “This is particularly important for small form factor, high volume electronics such as camera phones,” said McWilliams.